An infinity pool is custom designed and positioned to create the illusion of water extending to the horizon. 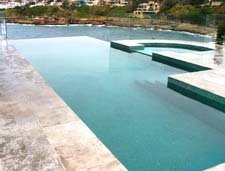 The poolside closest to the site’s outlook has a ‘wet edge’ constructed like a weir. The wet edge remains just 80 to 100 millimeters below your pool’s water level allowing water to continuously spill over and create the illusion that there is no edge at all. correct level so it appears to merge into your outlook. 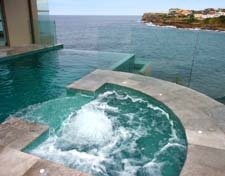 If you believe your location could entertain an infinity pool call Sunset Pools today on 1300 000 412. Your property’s unique potential should not be compromised; complete the enquiry form to arrange a site inspection. Ocean, harbour and lake views are the most popular locations for infinity pools, however uninterrupted views over the countryside and particularly distant mountains provide less apparent, but just as impressive locations where your Sunset pool can even reflect the sunset. The wet edge pool’s reflections can be particularly dramatic on starlit nights when your pool reflects the stars, moon and night sky. Sunset infinity pools, sometimes called a wet edge or negative edge pool can vary widely from extremely large irregularly shaped pools to much smaller rooftop installations in urban areas. Following a methodical site inspection every infinity pool is custom designed by Sunset Pools’ award winning designers and followed by an on site consultation to identify the pool’s location and orientation to achieve the most spectacular illusionary effect. While most pool structures have easily definable sides, a wet edge pool is apparently lacking one or more of its sides. As a result a negative edge pool creates the illusion that the expanse of water, lacking discernible edges, appears to float above and beyond the pool sites confines, to become one within its natural backdrop. 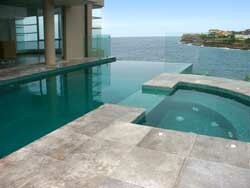 The infinity pool is especially effective when its wet edges are located over high ground that drops away. If near water, your wet edge pool will give the illusion that the pool water continues harmoniously to merge with the lake, harbour or seascape beyond. An infinity pool’s wet edge always forms the pools natural focus, the observer’s eye will invariably be drawn to the illusionary horizontal plane where the pools melts into the panorama beyond. Therefore it is very important that any infinity pool be designed to fit within and take full advantage if its natural environment. An infinity pool is best suited to setting off sweeping natural panoramas across the ocean, open sky, or mountains. If your view is of a neighbour’s house and fence, or anything you do not want to feature, you are much better off having Sunset develop a more traditional design that suits your site. 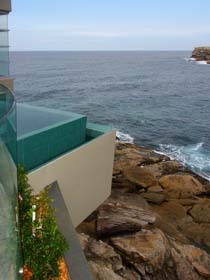 Or have them work with a landscape architect to see if a pleasing backdrop can be created to suit an infinity pool. 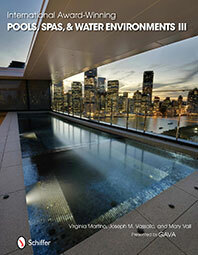 Infinity pool construction is far more demanding than traditionally built in ground reinforced concrete pools. The exacting requirements of it’s shape and placement, plus the critical nature of the structure’s wet edge also make it more complex to install. 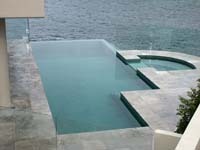 Wet edge pools also demand a fully automated top up system and bespoke hydraulics to maintain the wet edges operation. 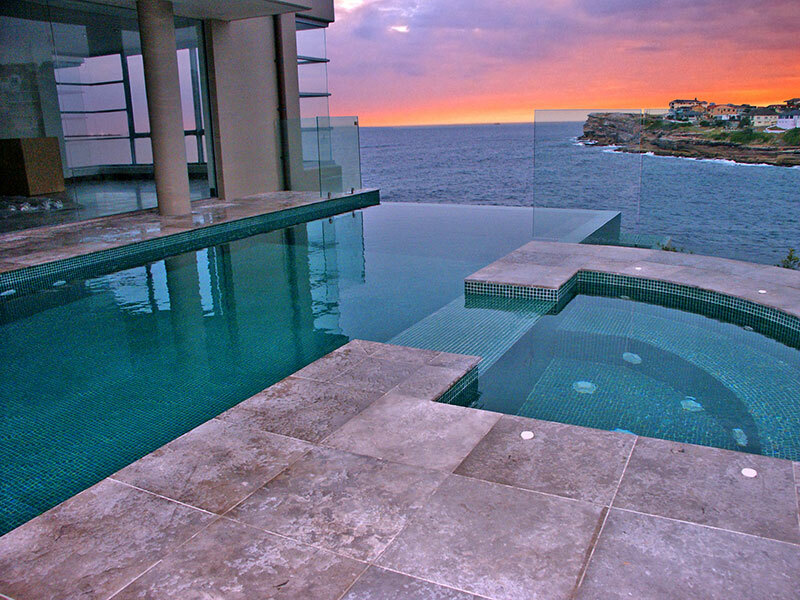 The expertise required to build infinity pools is considerable, Sunset Pools is among a very select small group of Sydney pool designers with a demonstrable capability, plus the sophisticated laser levelling equipment required to confidently tackle these challenging projects. The wet edge of your pool remains just below water level, and acting like a weir allows a constant flow to silently fall away. The design of your wet edge’s exterior and the finishes selected can maintain the wet edge’s placid tranquility with a sheer vertical wall, or alternatively create a sparkling cascade by introducing texture, a gradient, waterfalls and other Sunset design features. The spill from your wet edge flows into your pool’s balance tank, a reservoir capable of retaining an additional 8% of your pool’s capacity constructed below the wet edge. This balance tank forms an important component of your pool’s water management system, once collected water is filtered, sanitised then returned to the pool at exactly the precise rate to maintain the water level just above the pool’s wet edge. Wet edge swimming pool hydraulics are by necessity located below your pool and therefore mandate special attention including the installation of non return valves and sophisticated digital control systems to guarantee flawless long term operation and automatically account for evaporation and rainfall. To achieve the uninterrupted illusion of infinity, traditional pool fencing can not be installed along your swimming pool’s wet edge. Sunset have perfected some pool perimeter safety options for wet edges that ensure an infinity pool remains an appropriate preference for families with children. If you and your family are fortunate enough to have an appropriate outlook, and a site able to be enhanced by the infinity effect consider having Sunset design a safe negative edge pool to take full advantage of your locations natural attributes. A Sunset infinity pool epitomises ultimate luxury and can include top of the line underwater audio and video surveillance cameras, plus the latest in pool heating and lighting technology. When you at last have the view you dreamed of call Sunset Pools on 1300 000 412 to double your pleasure and optimise its lasting value, or complete the enquiry form right now to arrange a no obligation site inspection.